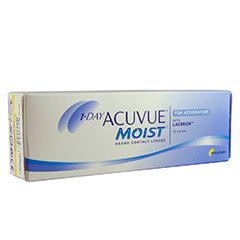 We offer all of the top brands at the best prices, including 1 Day ACUVUE MOIST, a lens designed for sustained comfort and moisture all day long. 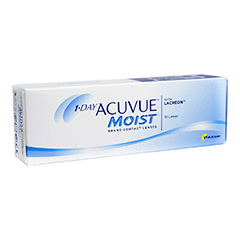 ACUVUE MOIST lenses contain an ingredient very similar to natural tears, meaning your eyes will stay fresh and comfortable for longer. 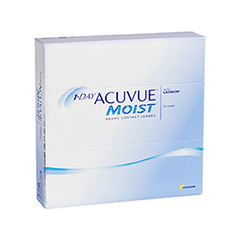 We dispatch to you the same lenses that your optician has prescribed for you themselves, giving you peace of mind that the lenses you have ordered are very safe and 100% correct for your vision. 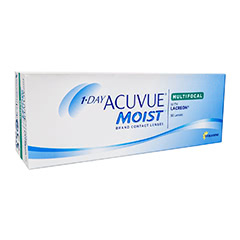 Because we buy in bulk, we save our customers up to £240 on contact lenses each year, whilst boasting excellent safety credentials including our own in-house opticians and a no-questions-asked money-back policy, meaning that you can return your ACUVUE MOIST lenses unopened to us within 21 days of purchase and receive a refund. Lenses are dispatched within 24 hours.